Hunters are being cautioned to watch out for electrical equipment as Wisconsin&apos;s mourning dove season opens. Leah Van Zile of Wisconsin Public Service says the doves like to sit on power lines. She says hunters should avoid taking aim at birds during that time, because they could damage the lines. That could result in power outages, injury, and the hunter having to cover the cost of any repairs. Van Zile says the bottom line is to know where you are shooting, and know what is beyond your target. The DNR says an estimated 10 to 15 thousand hunters have taken to the fields in pursuit of morning doves in recent years. Officials say during this period, doves have shown a one to five percent increase in population, while hunter harvested an estimated 100 to 200 thousand doves annually. 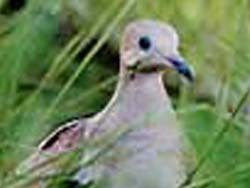 The mourning dove season runs through November ninth.